I watched a YouTube live broadcast from the InSight mission control area and saw lots of images of happy people cheering and jumping up and down, which is great! If it wasn't 4 AM where I was I might have as well. Being the nerd though, I'd hoped for a view of some big screen showing a 2D histogram of frequency versus time, showing those little dots move to higher and higher frequency as InSight's dataless tone became less and less Doppler shifted. Question: Was InSight's tone captured by Max Planck or Green Bank? Did the signal get plotted somewhere? 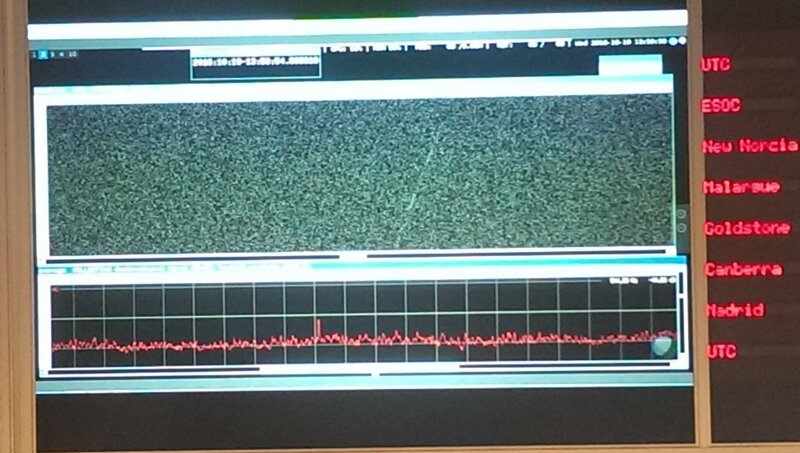 Below: Example of a 2D histogram for the ExoMars Schiaparelli Lander, Schiaparelli’s UHF Signal captured by GMRT prior to Entry – Photo: ESA Data was received from the Giant Metre Wave Telescope in India. See Was the time of Schiaparelli's landing chosen specifically so the Giant Meter Wave Radiotelescope could listen? Browse other questions tagged radio-telescope doppler-ranging delay-doppler or ask your own question.